The photo shows a flexible discharge pipe attached to the safety valve which opens when something goes wrong inside the water heater tank. Plumbing requirements state that the discharge pipe must be the same size as the safety valve opening to ensure water flows unrestricted through the pipe – and the pipe must be rigid pipe to withstand excessive water pressure. A flexible pipe is thin-wall and corrugated (accordion-like) to make it flexible. The inside diameter of the flex pipe is smaller than the valve opening – this is called a pipe restriction. 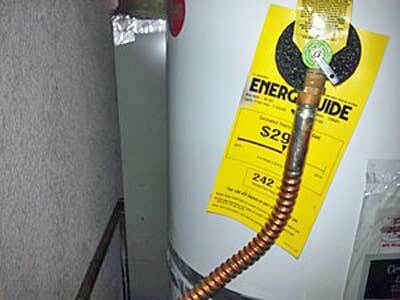 Why does the home inspector report a flexible discharge pipe as a safety concern? If a temperature/pressure relief safety valve opens because of high water temperature and pressure inside the water heater – there’s a good chance that the flexible pipe will come apart and possibly injure/scald someone.